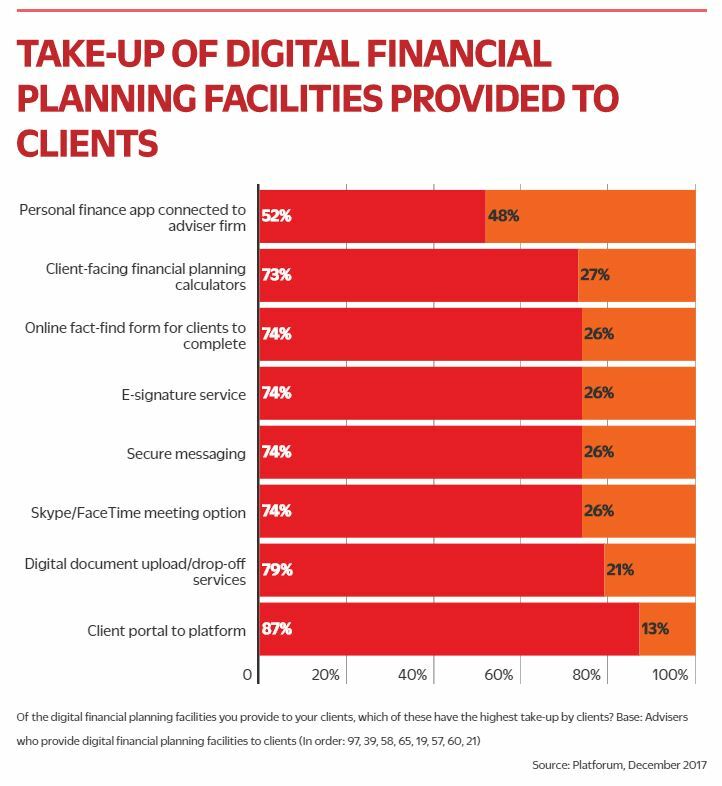 Advisers often say their clients do not want to know about new technology, yet when clients are offered the opportunity to use up-to-date digital methods, about three-quarters of them take it up. That said, if you thought the new Mifid II rules will mean more advisers choosing to communicate more effectively with clients via technology, you would be wrong. Doing as much seems to be low down on their list of priorities. Many advice firms continue to persevere with the traditional approach to personal interaction: face to face meetings. But there are problems with this strict old-fashioned attitude. From both the client and adviser’s point of view, such meetings can be disruptive, expensive and time-consuming to attend. Yes, some clients will need more face-to-face advice – and advisers will want to provide it – but effective use of time is crucial nowadays. A growing number of advice firms are moving towards offering more technological communication solutions to clients – but there is more work to be done. Figure one shows the proportion of advice firms offering different digital facilities to their clients. It is notable that the only facility offered by more than half of advisers is a client portal to their platform. However, what is extraordinary is that over a third of firms do not offer such a service. One may sympathise with the adviser who told us that: “I personally do not want my clients to be looking at their investments every day.” But the alternative seems excessively paternalistic. Among those advisers whose clients are offered access to the portal to the platform, most (87 per cent) say they log in. According to one adviser we spoke to, access at least two or three times a year was common, while another said that 90 per cent of their clients now look at their portfolios online. 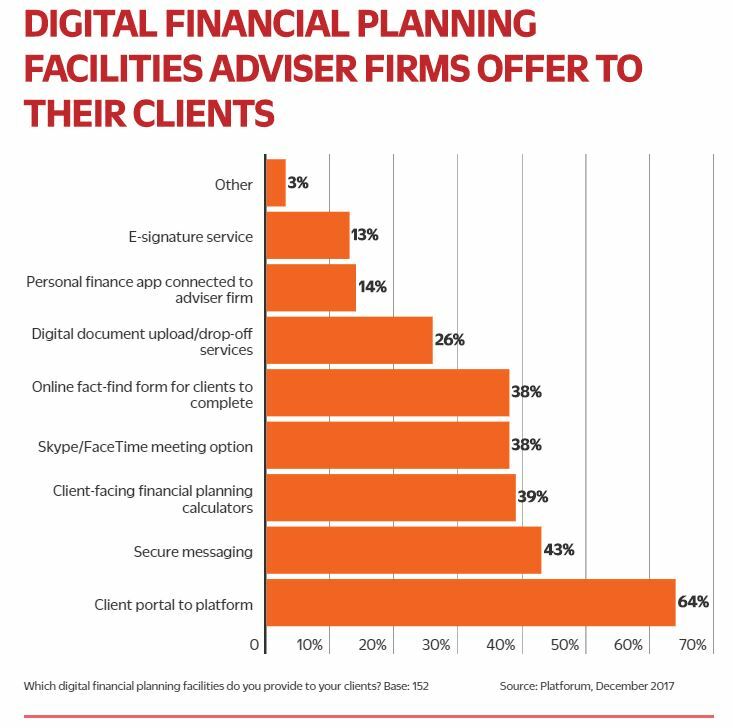 In fact, where clients are offered these facilities, the overwhelming majority of advisers say they take them up on it (see figure two). The exception to this rule currently is the use of a personal finance app connected to the adviser’s website, with just over half of clients using such a service. Such positive take up from clients strongly suggests that the barrier to introducing such technology solutions – “Because our clients would not like it” – is more of a creation in the mind of the advisers. Margins will come under increasing pressure in the next year or two and advisers will need to provide more benefits for lower or, at best, the same costs. Increasing productivity is the way to go, with Skype or FaceTime meetings, online factfinds and e-signatures. What is more, some of the digital facilities are much more secure. Secure messaging and digital document services are valuable additions to the adviser armoury against fraud. Everyone is using email but too many advisers are still using the free and insecure web-based services, as well as unsecured access through public wifi. It is time to wise up.